A former US soldier has pleaded guilty to the random sword murder of a black man, in New York’s first ever terrorism conviction of a white supremacist. James Harris Jackson admitted killing 66-year-old Timothy Caughman as he collected bottles for recycling in Manhattan on 20 March 2017. The 28-year-old US Army veteran, from Baltimore, also admitted stalking black men at Times Square before the attack. Jackson is expected to spend life in prison, the district attorney says. “White nationalism will not be normalised in New York,” said District Attorney Cyrus Vance Jr in a statement following Jackson’s conviction. “This resolution won’t bring back Timothy Caughman, a beloved New Yorker who was executed for being black on a midtown street corner. “It won’t reverse the alarming rise of white nationalism in America. Jackson’s guilty plea makes this case the first-ever conviction in the state for murder in an act of terrorism, said the New York prosecutor. At his sentencing on 13 February, Jackson is likely to receive a life sentence without possibility of parole – the maximum sentence under New York law. In an earlier statement, the district attorney said that Jackson had “prowled the streets of New York for three days in search of a black person to assassinate” in a “campaign of terrorism”. 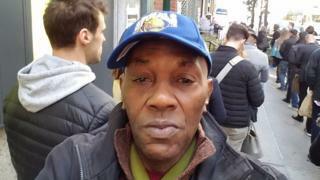 Jackson told police Mr Caughman’s killing was practice for future attacks, adding that he hoped to “inspire white men to kill black men, to scare black men, and to provoke a race war”. The ex-serviceman travelled to New York on 17 March, and plotted his attack while staying at a Manhattan hotel. On 20 March, Jackson began searching for a victim, wearing a long coat to hide his 26in (66cm) sword, according to police. He came across Mr Caughman while the older man was collecting bottles for recycling from rubbish bin and stabbed him in the chest and back. Mr Caughman managed to walk bleeding into a police station, and later died in hospital from his wounds. A day later, Jackson turned himself in to police, though during trial proceedings he initially pleaded not guilty.